The above photo is the photo I saw on the YachtWorld website. A few weeks later, we owned her. 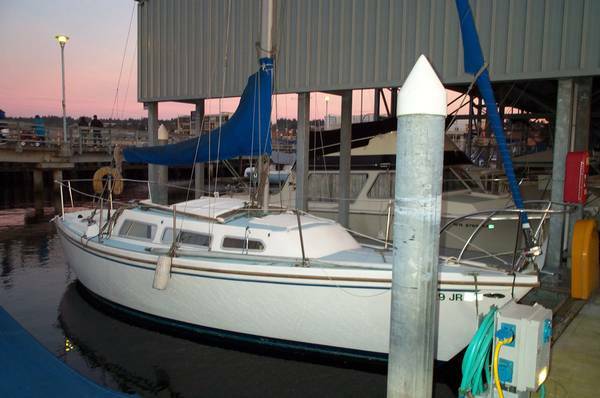 The first summer was devoted to learning how to sail and seeing if this boat was worthy of a resotration job. I decided I liked this little boat enough to try to bring her back to her prime. I had no idea then how much work I had taken on. These pages document that work. The Way She Was - How she looked when we bought her. Bulkhead Repair - How replacing a single bulkhead turned into a complete interior remodel. Painting - Painting the deck. A lesson in patience. The Way She Is Now - The project nears completion. Miscellaneous Projects - Various other projects I've done on the boat.